PATTERN: This project is based on a free crochet pattern from Suzetta (link). My changes are noted below. 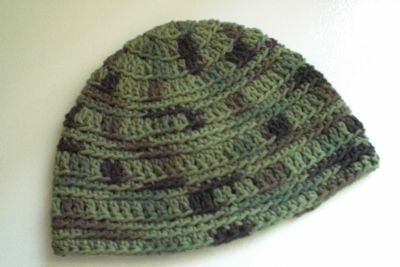 This is an awesome hat pattern that I would definitely make again. The shaping was nice and Suzetta’s instructions were easy to follow. Hat worked in soft cotton for a friend who just had brain surgery. She really liked it. Head circumference: 18″ (will stretch to fit 19″ head). Hat is 7″ long. To make a larger hat, work increases in round 10 as follows: Ch 2, [dc in each of next 4 dc, 2 dc in next dc] — 72 dc. Join round. Then work rounds 11 through 15 per the full pattern and finish as desired. Start at the crown and work until the hat has a 6-inch diameter. Work even rounds without increasing until the hat is the desired length (at least 0.5″ / 1.25 cm longer than the diameter). 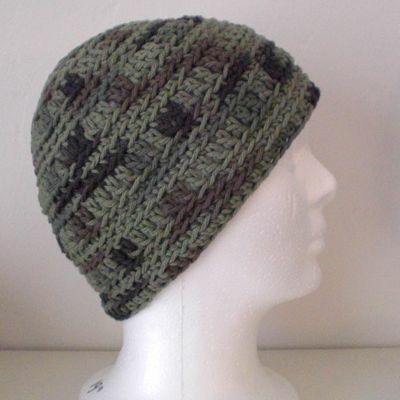 a) This hat is made in joined rounds (not spirals). Work rounds without turning. b) Starting with round 2, work in the back loops only. c) Ch 2 at the start of each dc round does not count as a double crochet or a hdc (just as the ch 1 turning chain does not count as a single crochet). The ch-2 just provides the right height for the round. d) The square brackets [ ] denote a set of instructions to be repeated all the way around. Each increase round adds 12 sts. e) Join each round with slip stitch at the end. Start with the EASY MAGIC RING technique (link) from freshstitches. Work 5 sc into the ring. Join – 5 sc. 1. Ch 2 (REMEMBER, THIS IS NOT A DC). Work 12 dc evenly spaced into the 5 sc — 12 dc. Join. Note: From this point on, work stitches in the back loops only. This will create a ridged effect. Work rounds 2 through 9 per the full pattern. 10. DO NOT INCREASE. Ch 2, dc in each sc around — 60 dc. Join round. Work rounds 11 through 15 per the full pattern, but with 60 sts per round. 16. Ch 2 (not a hdc), hdc in each sc around — 60 hdc. Join round. Slip st in next st.
Fasten off, leaving a 6-inch tail. Weave in all ends. American crochet terms are used in this pattern.